These are some recommendations. Please know that I am not an expert on any subject, so use your common sense and check with your doctor if you have questions. My background as a western medical doctor, some knowledge of acupuncture and Traditional Chinese Medicine, familiarity with ostepathic concepts and practice, and some years of sincere TaiJi practice creates a somewhat unique opportunity to express the commonalities in these disciplines. As more Americans live longer and longer, healthy and appropriate forms of exercise will be an increasingly important part of lifestyle. Taiji (Tai Chi) is one very helpful and popular form of exercise for Seniors. This practice of gentle and slow movements that enhance balance and calmness have many physiologic and emotional benefits, hence Taiji's growing popularity among our elders. In medicine we say " do no harm." This basic principle must also be followed when teaching Taiji to Seniors. Many 60, 70, 80, and 90 year old students often have medical and surgical histories that must be considered. In the writings below, the issues of modified practice for seniors with Total Hip Replacements will be addressed. The hip is a "ball and socket" joint, meaning that one bone (the leg bone or femur) has a round ball-like end that fits into a cup-like cavity of another bone (the pelvis or innominate bone.) This arrangement allows for a wide range of movements, in contrast to "hinge joints" such as the knee. 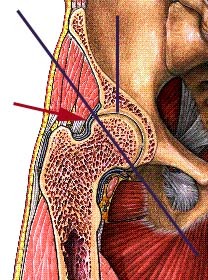 In the illustration below, hip joint is shown. 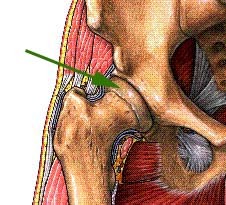 The green arrow points to the articular cartilage that provides a smooth surface to protect the bones during movement. As the range of motion of the joint is engaged, this surface moves and rotates freely within the cavity of the innominate bone. In the view below, the bones have been cut through to enable us to see a few important features. 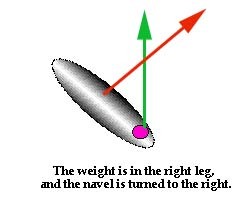 The short vertical purple line shows the direction of the force of gravity, which is transferred through the hip joint through the leg, through the foot, and into the ground. The diagonal line shows that the pelvic bone's cup does not completely cover the entire vertical surface of the ball. Note the red arrow. This region is one vulnerable area for a hip dislocation. Another "risky place" is seen in this back view. Note that the angle shown above is also found in this view. If the hip is turned to an extreme position of folding/closing (turning the navel to the right while the right toe is pointing forward) would create stresses, where, if the tissues where compromised, the ball of the hip could "pop" out the back, or dislocate. 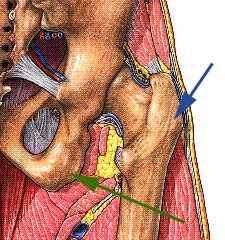 The green arrow is the "sit bone" part of the pelvis, and the blue arrow is the hard bone easily felt on the side at the upper part of the femur, called the Greater Trochanter. This side view shows a vulnerability to dislocation if the navel is turned to the extreme left while the right toes are pointing forward. In this illustration, an aspect of the procedure for surgery for Total Hip Replacement replacement is shown. Note that the neck and ball of the femur has been cut off, and that the cavity in the pelvic bone has been enlarged to be able to receive the artificial cup. In this picture the finished arrangement is shown, with the stem of the prosthesis in the femur and the neck and ball of the prosthesis inserted in the prosthetic cup. Note that, essentially, the angles of the normal hip appear to be maintained. There are some subtle aspects that are important, but are beyond the scope of this writing (such as offset of the center of rotation). However, no matter how brilliantly engineered, an articificial hip is not the same as a normal healthy hip. Reference was made earlier to compromised tissue facilitating the possibility of dislocation. Surgery such as this does significantly compromise the tissues, since many of the supporting muscles and ligaments have to be cut through, then surgically repaired in order to perform the surgery. 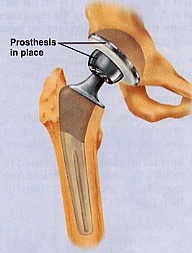 The resulting weaknesses can be a major source for dislocation of the artificial hip. After surgery, patients are given very specific instructions about how the leg may be used without causing dislocation of the prosthesis. Some of these prescriptions are quite life-changing. For many weeks, activity is very limited as the tissues begin to recover from the surgical trauma. 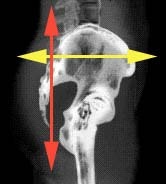 The hip cannot be bent to more than 90º. This means no low chairs, low toilets, etc. also, merely tying one's shoes incorrectly could lead to dislocation. Over time, the tissues do get stronger, but some movements must continue to be avoided. In TaiJi, we teach the principles (from the Chinese classical teachings) that guide the movements. Are these principles in accord with good medical and common sense? Yes, I believe that they are. Following the principles can lead to stronger tissues and a lower likelihood of dislocation. One principle is "Upright Body." This means that there is a clear vertical orientation, from suspended headtop to the "bubbling spring" on the sole of the foot. We talk about "sinking the sacrum." This is accomplished by relaxing, especially the muscles in the low back (lumbar region). As we relax, imagining a ten thousand pound weight on the tip of the tailbone, the lumbar muscles can soften. Note the red arrow on this side view x-ray illustration. There is also a clear horizontal orientation. 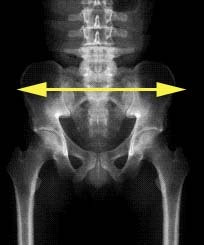 Note the yellow arrow above: The pelvis MUST stay level in all dimensions, front-to-back and side-to-side. 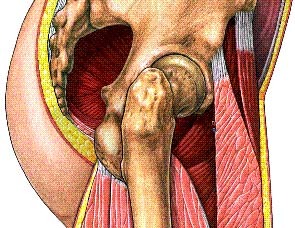 As the sacrum sinks, the pelvis can become more level, rather than tipped forward. It is equally important not to thrust the tailbone forward, pointing the navel (Dan Tian) up and tilting the pelvis in the opposite direction. This front-to-back direction must be level and not tilted. either too up or too down. Again, the teaching, "use mind, not force" is central. See how stable the hip joint is! Tipping so that the right hip bone comes up puts stress and strain on both hip joints. The same is true when we tip up the left. If, as the weight is shifting, there is a sense of "poking out" at the GreaterTrochanter of the femur, the hips are probably unleveling, and the force of gravity is not being conducted vertically. Keeping the pelvis level is one part of avoiding total hip replacement problems. The other important concept is to not over-turn to the extremes (due to all of the considerations described earlier). So what is considered too much turn from the hips? After reviewing this question with an orthopedic colleague, the following suggestions are made. 1. Do not turn in more than 30 degrees. 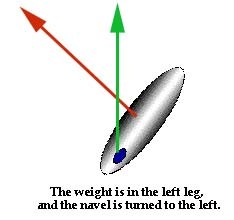 The navel (Dan Tian) can be thought of as a vector (arrow). When our navel, knee, nose and toe (knee and toe of substantial/ weight-bearing ) are all aligned, the vector of the Dan Tian and the vector of the foot direction are the same. 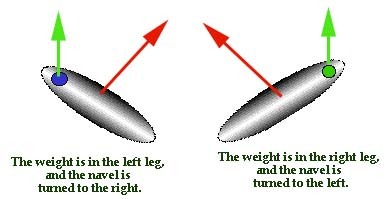 When turning to the left while in the left foot, for example, the vector of the foot can be thought of as the zero point, and the hips safely turned until there is a 30 degree difference. 2. Do not turn out more than 30 degrees. The same "tracking system" can be used here. Turning out more than 30 degrees can also cause hip dislocation. More important than these technical form requirements are the principles, which are not compromised. Relax, Upright Body, Turn from the Hips (with reasonable limits!) and clear differentiation of yin and yang (full and empty) can all be done. Therefore the benefits of practice will be maintained. Practice of TaiJi increases body awareness and discipline. I sincerely believe that correct practice, will, over time, strengthen the tissues and decrease the likelihood of problems. 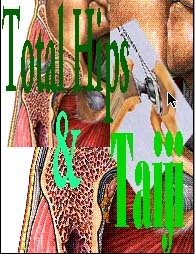 Indeed, it may be that TaiJi practice is a very helpful and useful exercise for people with Total Hip replacements.